Right now, a 5K would intimidate me. 10k would be a desperate slog. A marathon? Well, I’d definitely pull a Rosie Ruiz. But seven marathons? Seven days in a row? 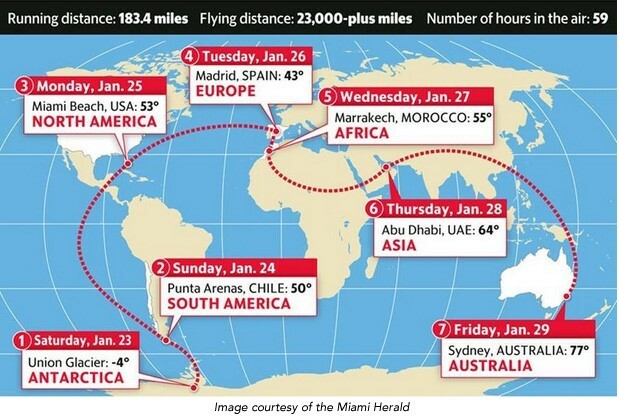 On seven different continents? Isn’t that what Satan makes people do in the ninth circle of hell? And yet, this is a thing. A runner named David Gething won the first event in 2015 with a total time of 25 hours, 36 minutes and 3 seconds, for an average marathon time of 3 hours, 39 minutes and 26 seconds. That’s a good marathon time run once. But 7 times? Olympian Ryan Hall ran in the 2016 event and blogged about his experiences:. Here are a few excerpts. The most challenging part of being in Antarctica is getting used to 24-hour-a-day sunlight. We were staying in camping tents so it was impossible to get darkness. I’m really looking forward to getting a good night’s rest tonight at a hotel in Punta Arenas, Chile. This entire course was concrete, which is brutal on the legs—my calves were absolutely hammered the last 10k. Luckily I have my extra cushy Asics 33-M to help offset the pounding. I would never recommend running a step on concrete. It’s 10 times harder than asphalt. The marathon is going to hurt no matter if you run a 5-minute pace, a 7-minute pace, or a 10-minute pace, so I figure if I run fast than I’ll get done in less time. I also think it’s a lot easier to establish a good tempo early and just try to hold it. Even if you slow down later in the race you will have bagged so much time that you’ll still come in ahead of schedule. I had a much more conservative race strategy this time and was just trying to run around eight minutes per mile. My calves felt like rocks from mile one so I was only able to maintain that pace through 20 miles before the wheels completely came off and I had to do a couple hundred meters of walking, which was a first for me. When I woke up I felt like death and nearly toppled over when I took my first steps. On the starting line I was planning on trying to run as much as I could before doing some walk/running. So when I began I was surprised to find that my previously rock-tight calves felt surprisingly normal. Not only that, but my energy actually felt good and my Surge showed that my heart rate was low. I gradually increased my speed until I was clipping along at a 6:40 pace feeling like a million bucks. The other challenge of the day was the heat and humidity. We were running in mid-80-degree weather with high humidity, and that’s in winter—imagine the summers! I was drinking fluids and taking gels and candy every 2.62 kilometer, or 1.6 miles. Yet despite all the hydration and calories I still got chills in the last lap, which is a sign of dehydration. My advice for running in the heat: Drink as much electrolyte-rich fluids as your stomach can handle and drink it before you feel like you need it. Another thing that worked really well for me today was putting crushed ice in my hat to help bring my body temperature down. I knew I was in trouble today as soon as I walked off the plane. The subtle pain in my right hip had been getting worse and worse over the course of the last two marathons. I wasn’t able to walk without a limp, so I knew I wouldn’t be able to run without a limp either. It was a long day, to say the least. I may have set the world record for the biggest time differential between your fastest and slowest marathon as I took over 5 hours to finish today. I got a massage part way through the race, which helped for a couple of miles, but it was clear today was going to be one of those days you just have to put your head down and find a way to keep moving forward. Hall wrote that Sydney was the last marathon he would ever run. What a way to finish. Posted in Environment, Other Olympics, Others, Track and FIeld and tagged Dubai, Madrid, Marrakesh, Miami, PUnta Arenas, Ryan Hall, Sydney, Union Glacier, World Marathon Challenge. Bookmark the permalink.